HYDROCASE, the best electronic humidification system for your cigars ! 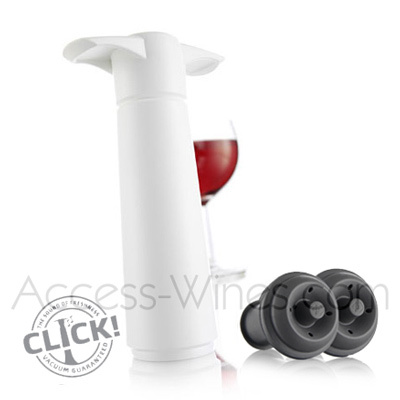 The vacuum pump preserves your wine after opening the bottle. This accessory is used to remove the air inside the bottle once it uncorked thanks to special rubber stoppers, which by a valve system does not allow air to return once the pumping is done. Use the Vacu-Vin pump after the uncorking of the bottle, you retain the content without oxidation for a longer duration. 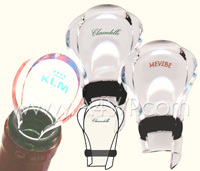 The Vacu-Vin «Wine Saver» suitable for conservation of all types of wine, except sparkling wine. 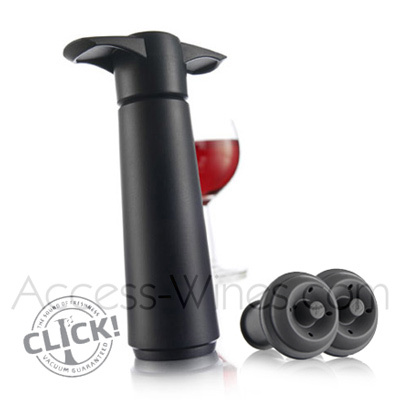 The Wine Saver pump draws air and the reusable rubber stopper seals the bottle so the wine remains preserved from oxidation phenomena, thus preserving for several days all his qualities. The bottle can be opened and recapped as many times as desired. The vacuum pump have a vacuum indicator who CLICKs when vacuum is reached. If you pump regular air from the same bottle to make many tastings, the result will inevitably be a loss of flavor and bouquet. In this case use the Vinoserv system which guarantee a perfect preservation of wine. » Becs verseurs anti-goutte "Wine Server Cristal"